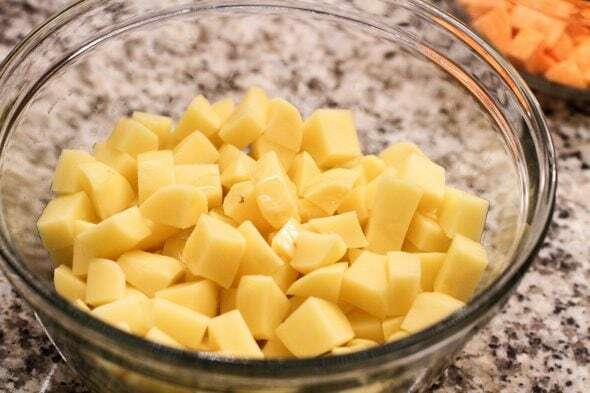 For many years, I made potato cubes by cubing potatoes and then cooking them in a skillet with oil. That kind of got the job done, but it required SO MUCH OIL, it took 45 minutes, and I had trouble with the outsides of the potatoes getting burnt before the insides got cooked. 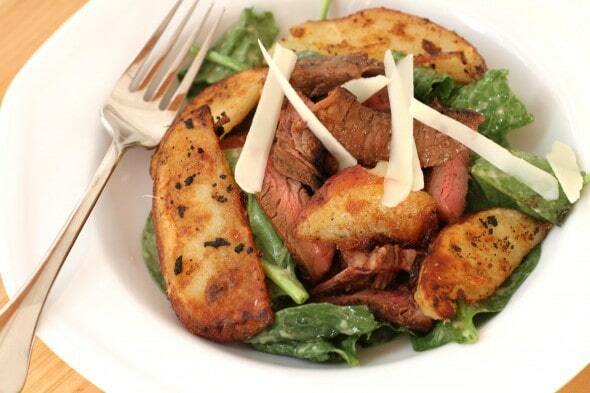 But then some years ago, I tried an ATK recipe for a steak and potato salad and my potato cooking life changed. This salad has potato wedges in it, and the recipe called for par-cooking the potato wedges and then browning them on the stovetop. This produced potato wedges that we perfectly cooked on the inside while also being perfectly browned on the outside. And it took so much less time than the raw potatoes + skillet method. So, I decided to try this with potato cubes as well, and I have never looked back. Parcook your potatoes, friends! It’s life-changing. This is really more of a method than a recipe, but here’s how I go about making my potato cubes. Parcook the potatoes in the microwave. First, peel and cube your potatoes. I use either red potatoes or Yukon Golds. Russets may work too, but they’ll be a little more prone to falling apart when you parcook them. 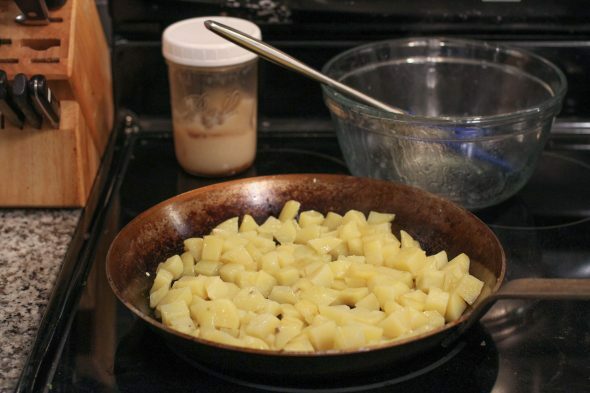 Drizzle the potatoes with a little oil (maybe a tablespoon per pound) and toss. Cover the bowl and microwave the potatoes until they’re softened, stirring about halfway through. The amount of parcooking time you need will depend on how many potatoes you have and how powerful your microwave is. For a bowl this size, in my microwave, it usually takes a total of 6-7 minutes. The shouldn’t be total mush, but you should be able to pierce them with a paring knife and meet with no resistance. Fry the potatoes on the stovetop. Now it’s time to brown them! You’ll need some kind of fat to heat up in your skillet. The type is up to you, but I always use leftover bacon fat. I just pour it into this jar whenever I cook bacon, and that way I always have some in the fridge. Once the fat is hot (hot fat = beautiful browning), add the potatoes. Cook them for several minutes without stirring, and then give them a stir to flip the browned sides up and the unbrowned sides down. Let them cook for a few more minutes, adding more fat if necessary to prevent sticking, and give them another stir, repeating the process until the potatoes are as brown as you’d like them to be. This is not going to be a perfect process, mind you. Unless you turn each potato cube by hand, you will not manage to evenly brown all four sides of each cube. But they’ll get brown enough to take on a lovely color and flavor, and no one at my house has ever complained about an unbrowned potato cube side. Once they’re done, salt and serve them while they’re hot! Like many potato recipes, these are best right after they’re cooked. But if you misjudge how hungry your family will be, leftovers work pretty well heated up in a cast iron skillet. Let me know if you try these! « WIS,WWA | The first one in 2018! 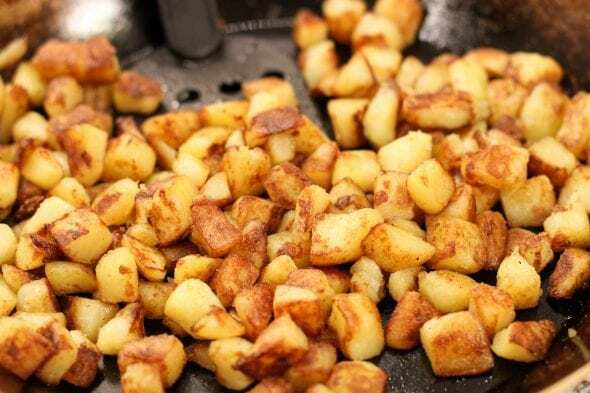 British roasted potatoes (“roasties”) are made by parboiling, then roughing up the edges, then roasting in hot fat, preferably duck fat or goose fat. 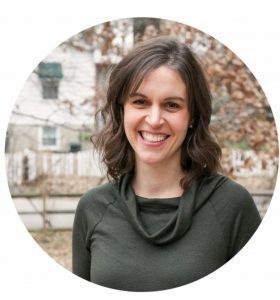 how do you go about roughing up the edges? Parboil the potatoes (or parsnips) in water then strain into a colander. Shake the veg around in the colander which roughs the edges up. If you have parboiled too much the potatoes fall apart a bit, but those bits make for crunchy goodness once roasted. Veg can be parboiled and roughed up a day in advance if necessary. 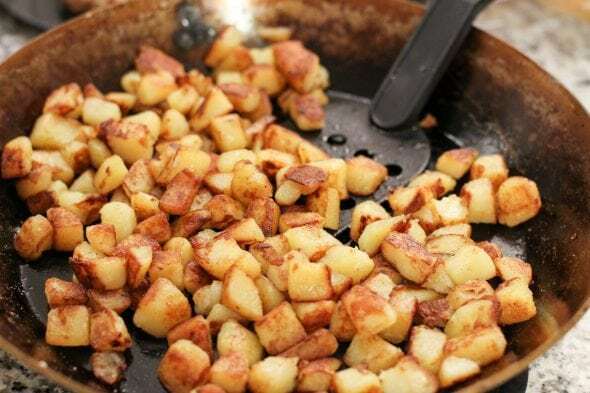 I boil the potatoes 10 min, drain then return to the saucepan & let air dry for a couple of minutes as I find dry potatoes brown better, put on the lid, hold lid onto saucepan, shake n toss; viola roughened potatoes, I then add a tbsp of olive oil, lid & toss then roast. I’ve been known to do this but one other thing I do is re-cook leftover baked potatoes and make them into home fries. It’s more reheating and browning at that point. I do that, too. It’s so good and a tiny bit healthier with the skins on. Ooh, good idea, never thought of that! I do the same thing. Every time we have baked potatoes I make extra and plan on fried pototaoes and onions the next night. Paired with eggs it’s also a cheap meal. Also, Heston Blumenthal the chef recommends boiling the potatoes along with the peeled skins in a bag for extra flavor. I haven’t ever done this but it’s an idea. LOVE potatoes cooked in bacon drippings! I have also added onion and green peppers for extra goodness. Amazingly, over the years I have run into several people who have never re-used their bacon fat. My mother and grandmother both saved bacon drippings, so it’s a cooking tradition in my family. 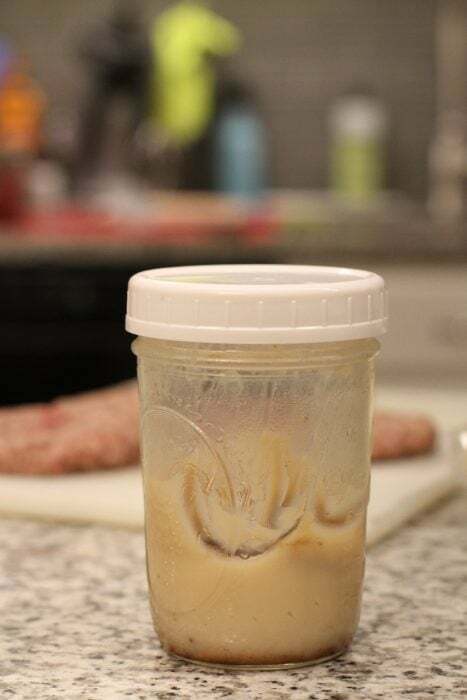 Never reused bacon grease? What a treat they have in their futures. Grease from homemade bacon from non-CAFO pork belly is especially tasty. I do this when I roast potatoes in the oven, cook them in a skillet, whatever. I cook the whole potato and then cube, but it’s pretty much the same. I do it with sweet potatoes that I am roasting or skilleting, too! It works much better. I’ll also do it to carrots if I want to roast then at the same time as slower roast veg (like broccoli). As a side note, a cube does have six sides, not four. Awesome! I will have to try that. Also, I’m glad someone else saves bacon grease. I used to throw it out, but its so yummy, and I realized I was throwing out oil to replace it with other oil. Not frugal. Plus its yummy. I learned years ago to make my bacon in the oven. So much easier than in a frying pan. Huh, I’d never have thought to use it in bread dough. Does the flavor come through very strong? I’ve taken to cooking bacon on the BBQ for the carnivores in my family (put it on the 2-piece broiler rack from my oven, then throw the whole mess on the grill, turn it a few times until it’s done, take care not to singe my eyebrows off if the bacon fat flares up) — might have to try the oven, though — that sounds pretty handy. I’m a big fan of dirty potoates – taters with the skins left on. High five in parcooking solidarity. Works great also to speed up baked dishes (think scalloped potatoes with ham, which normal people make with sliced potatoes but I totally prefer to do with cubes). Yup, great idea! I’ve been microwaving potatoes for years and they come out perfectly. For cubed potatoes I like to spread them out evenly on a giant cookie sheet and let them roast in the oven with a bit of oil. This way, they cook fully and still get a slight crunch. We love our potato cubes in the oven as well, with oil and seasonings! I make my own version of Tastefully Simple’s Garlic Garlic…YUM!!!! I just flip them several times to keep all sides even. Deff in the oven vs on the stove. I can make double at one time. Growing up, my father would always have a pot of boiled whole potatoes in the refrigerator which he would use for fried potatoes, french fries, etc. They’re also easier to cut (or peel if you want to peel, though I prefer eating the peels) after they’ve been cooked and cooled. (He also saves bacon grease, which is something we do as well.) My FIL, instead, slices raw potatoes extremely thin using a mandolin for his fried potatoes. Are you my sister??? My father did the same with potatoes and bacon grease, and his example is still followed in my house. Yum. My grandmother kept a bacon grease can on the stove top but I refrigerate mine. This is so helpful! I have trouble browning potatoes. Also, you are exactly one day too late with your steel skillet recommendation, haha. Oh well! I think I decided on Amazon’s choice for a non-stick pan (Hubs has been asking for a non-stick option as an alternative to our cast iron for when we scramble eggs). making a pork poutine tomorrow and needed a potato that wasn’t going to take forever and really didn’t want to buy bagged French fries so this comes at a great time. Thanks! We do this for our hash browns too! I never knew the term parcooking, learned something new! I just saw this on the Food Network’s Worst Cooks show last night! My husband and I were like, “Doh!” We’ve been struggling to get the perfect cubed potato forever! That’s brilliant! I stopped making potato wedges and cubes because they were never cooked right. They were either burned or undercooked or both. Gotta try this recipe soon. This definitely has to work better than just trying to cook raw potatoes in the skillet until they brown. Thanks! Now if someone could just tell me how to make decent hash browns…. we never ate them, growing up, so I have no idea, and every recipe I’ve tried has been a failure. We do the same thing for has browns. Parboil or use leftover baked potatoes. Grate and then fry as you do cubes. When we get a huge bag of potatoes that we can’t finish fast enough, we boil them all and then grate or cube and freeze until we need them. Love ys, I do the same thing. Years ago I read an article about a small cafe famous for it’s hash browns and their “secret”for them. Partially cook whole potatoes, let them cool, then peel and shred. works great, they work best for me by being only partially cooked as they shred or cube easier than raw and cook faster. 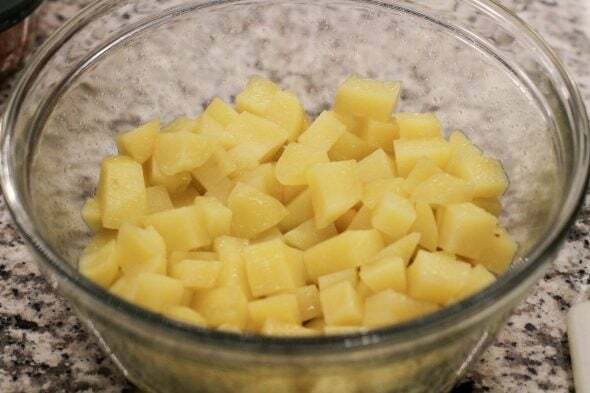 Also saw a tip for crispier fried raw potatoes, peel, cut into wedges, and cut them into cubes by angling cuts to produce sharper edges, the irregular shapes fry up crispy, so good. 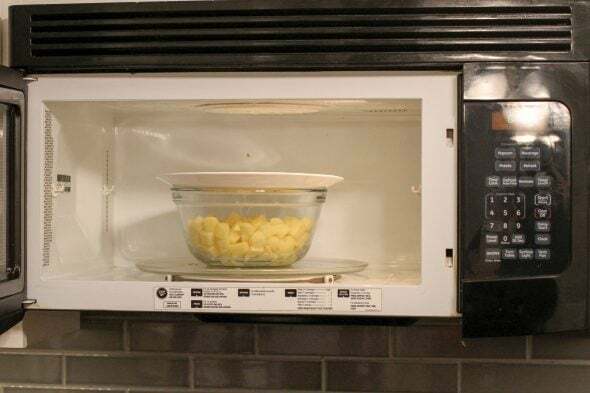 It never occurred to me not to parcook potatoes if frying or roasting, but then I never thought to use the microwave for it either so might try that. If you use new or charlotte potatoes for a meal or in potato salad, any leftover (pre-mayonnaise obvs) can be sliced and fried. Works with a fried breakfast (becon and eggs in England) or in a Spanish omelette. 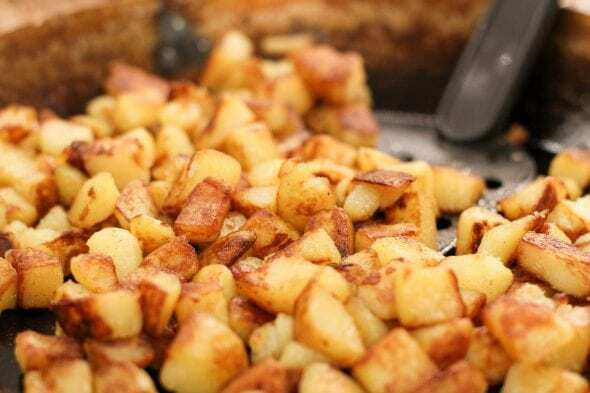 Fried potatoes also work great in, I guess you’d call it a hash in the US, with black pudding. Fry the potatoes until crispy in one pan whilst steaming kale in the microwave. In a second pan soften onion and sliced peppers, add peeled and cubed apple or pear and season. Add cubed or sliced black pudding and fry for a minute or two then add the cooked kale. Add other seasoning if you like then serve with the crisp potatoes. Very good for iron intake but I’m not sure whether you get black pudding over there. It’s kind of a blood sausages so recipe works with bacon or similar as well. 1.) Can the skins be left on? 2.) Why did you put a plate over the bowl? To keep the steam in, otherwise they get kind of grainy and hard on the top potatoes. Thank you so much for answering. I was wondering if anyone ever would. Glad to see you still use your microwave. It seems to me that today so many people have quit using one and even brag about it LOL. I would never be without a microwave- never. I can’t think of a day when I don’t use it. I definitely do still use mine, but I try to avoid putting any plastic in there. That seems to be the main culprit behind microwaved food problems. That said, when something can be toasted or heated in a frying pan or pot, I often choose that. I just like the way the dry heat of a skillet or toasted makes food taste, and I like the way that things like soup heat up more evenly in pots. But for things like reheating tea, the microwave is fantastic! This is the most perfectly timed post. I was planning on making baked potatoes to go with dinner, as I’m trying a new turkey meatloaf recipe that I have a feeling isn’t going to go over well with the younger set, but they love potato cubes. I only have russets, so we’ll see how those work out! Kristen, I notice you have a carbon steel pan. I’ve been researching them as I would like a skillet bigger than my 10″ cast iron (which I use a LOT) but do not want anything heavier as the one I have is as much as I want to lift (my 73 year old bad shoulders have a limit!). What brand do you have? And how do you like it as compared to cast iron? It’s heavier than, say, a nonstick pan, but it’s definitely lighter than cast iron, and it does a great job of searing things like cast iron does. My only quibble with it is that I wish it had a helper handle. Otherwise, great pan! Hi Kristen, it is a fab way of cooking roast potatoes too, same method (roasted in oven though) but with a bigger sized potato. I parboil the spuds, drain them well, add them back to the saucepan and put them on a medium heat, I then jiggle the saucepan around a bit to dry the spuds off and to roughen the edges of the potatoes, this gives them a really crispy finish. Then it’s into a really hot oven with a little oil and hey presto 35 to 40 minutes later you have gorgeous golden crispy roast potatoes, be still my beating heart. Love this method. Have a wonderful day. I love potato secrets! Thanks!! Here is mine: For roast potatoes, slice in 1/4 in rounds and layer in a glass baking dish with about a quarter cup hot water to just cover the bottom. Add copious amounts of butter & salt and Bake at 400 for 20 min, stir, and bake for 20min more. Golden or red potatoes are my favorite for this one. The water does the same as in your recipe – steams them to reduce cooking time so the outside doesn’t over crisp while the inside cooks. Thank you so much for sharing your recipe and tips! Very, very helpful. It’s making me smile reading all the British posters share how we always parboil, shake and then roast our spuds! We Brits LOVE our roast dinners and most families tend to cook them the same way. And eat them on a Sunday. I love that you save bacon fat, so do I! My family, all male other than me, yay me…LOVE meat and potatoes, so they’re never wasted in my kitchen. When I bake potatoes, I bake a few extra, cool completely leaving them whole or you can leave skins on if you prefer, place in a zip loc and chill over night; makes it much easier to cube. Next day, or when you get time, remove from fridge, and cube potatoes. Freeze or refrigerate the cubes in a Zip Lock until ready to brown. I cook the frozen cubes right into the hot grease bc they thaw almost instantly. I use olive oil, a pat of butter for browning, salt and pepper, and sometimes after cooking, I leave potoatoes in pan and top with a little leftover crumbled bacon, shredded cheddar, and place under broiler to melt. Remove from oven and top with a dollop of sour cream. My guys love it plain or dressed up, only sans the sour cream.